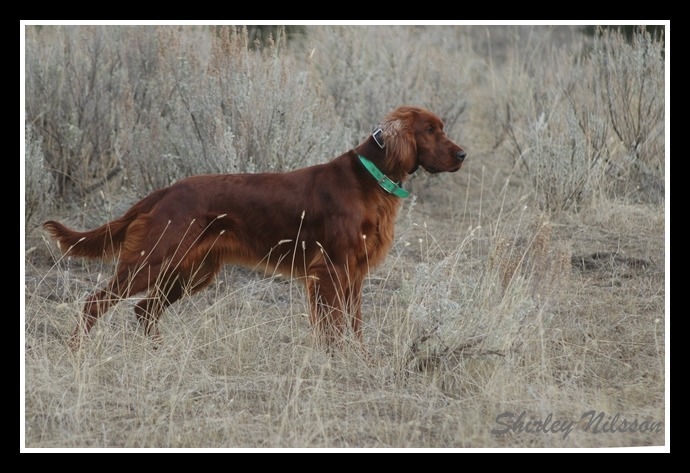 Hope is a nice honest gun dog with old fashioned style on point. She was exceptionally easy to break, and has moderate range. Hope is a fabulous house dog who simply adores people. She is very dark, her coat is excellent in quality and quantity - exactly perfect for a working gun dog. She is stoutly built, has very dark eyes, and very black pigment. She takes her work very seriously and at times a bit too seriously, I am hopeful that her first litter to Chukarhill Burn Notice will bring a bit more resiliency to her pups regarding training pressure. Hope has a brother in Germany and a sister in the United states both of whom have produced phenomenal working and looking pups; I have no doubt that Hope will do the same. A litter brother in Canada is working on his obedience titles and a sister in Norway is doing well at field trials. There is a good depth of ability and good looks in the litter that Hope came out of.